Manipal University has a rich heritage in India, with over 28,000 students from 57 different nations living in their eponymous university town. Among their alumni are well acclaimed thought leaders including Satya Nadella (CEO of Microsoft), Rajeev Suri (CEO of Nokia), and Rajeev Chandrashekhar (Chairman of Juniper Capital). To start with, we interviewed a few faculty, students, prospective students, and alumni in the early stages of the project to inform our goals and ensure the new site would meet their needs. We used persuasive techniques in the design such as providing the right kind of information at the most seducible points in their journey on the site, enabling students to make effective decisions. We rooted the design around the core idea of 'Inspired Learning’ where prospective students, current students, alumnus and faculty experience the pillars of 'Inspired learning' through real-life stories and powerful imagery, intended to depict thought leadership and hands-on-learning. 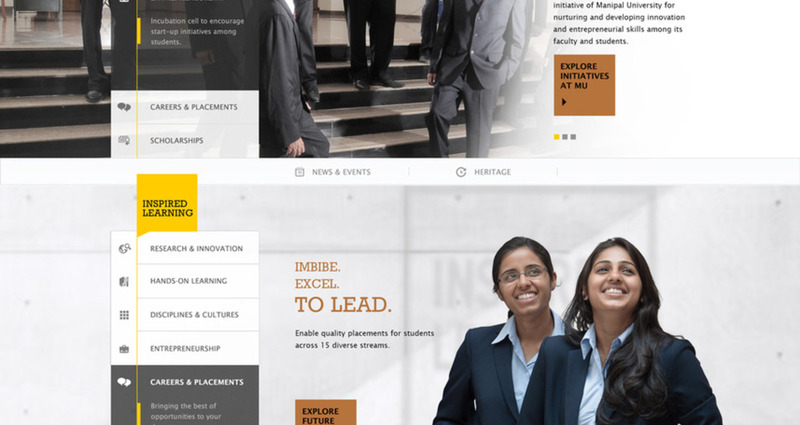 Manipal University was faced with the challenge of matching their online experience with the vibrancy and energy of its real campus. Being one amongst 9 other universities from the same group, it also had to establish a unique identity that highlights thought leadership, best in class facilities, distinguished faculty and rich alumnus network. Being a University that provides around 175 courses across 15 disciplines ranging from Engineering, Medicine to Management, they had to highlight uniqueness of each of their colleges and departments. They also had business challenges of re-establishing themselves in a very competitive landscape; generating leads and converting eyeballs to tangible admissions besides the need to highlight the rich heritage and the vision of the founder. The ask from SapientNitro was to redefine MU’s online brand and content strategy, design a responsive experience, build a CMS platform, use real campus videos and photo shoots, and create engaging content. The goal, in short, was to turn up the volume. We wanted to create an experience that would amplify every aspect of the MU brand; e.g., Thought leadership, Culture and campus vibrancy, it’s rich heritage, while at the same time, Increase leads and admissions. The digital canvas of MU website uses powerful and engaging visuals, offering a striking and imaginative approach to storytelling. We engaged our in-house photography team to take pictures of the MU campus and it’s students so as to give a true experience of the campus life. Action-oriented and candid imagery were captured and used. The effort resulted in an effective storytelling. The Navigation model used enables users to quickly get to the content they seek. The Navigation is also modeled on requirements of various user segments, parents, faculty, staff, current students and alumni. Each of the schools within the university has navigation and links in context to the school selected. We then created a wireframe prototype to define the features and functionality that would marry the University’s marketing goals with its online presence. Usability testing on the wireframe prototype with MU students reinforced the site’s direction. The website provides sections to streamline target audiences, clear calls to action, and a consistent look and feel across departments. Persuasive content such as Student testimonials, prospective jobs and companies are provided at the right juncture of the user journey; these are aimed at persuading prospective students and aid them in their decision-making. Long page and in-page navigation allows user to get the information they seek on the same page. The components on the page are very interactive and engaging. 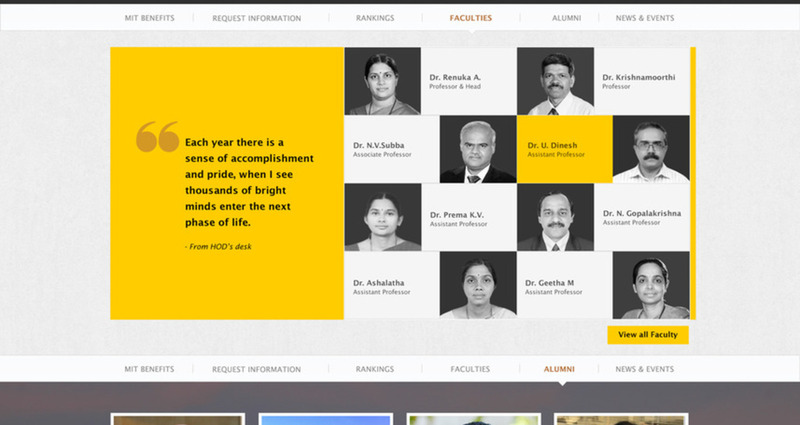 E.g., showcasing labs and other facilities, History timeline, Disciplines and courses. Unique interactive module on the homepage tells MU’s brand story of ‘Inspired Learning’. The entire experience has been delivered using Adobe CQ platform with personalization using Test & Target, and Omniture as the underlying analytics framework. The careful choreographing of each of every facet of the brand into a single experience brings the vibrancy of Manipal University and it’s story of ‘Inspired learning’ to life.